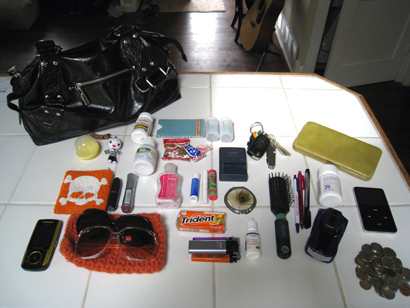 susannahbean: What's in my bag? You asked for it! I cheated a little, I cleaned it out before taking pictures. Just imaging this stuff plus three Sharpies, a wrench, six other pens, and a whoooollle bunch of old receipts and shopping lists! You had a wrench in your purse? That's awesome. Seriously.